WASHINGTON, DC — The Internal Revenue Service today reminded many small tax-exempt organizations to file their annual electronic informational return with the IRS by the May 15 deadline. This is the second year of the new requirement for tax-exempt organizations whose gross annual receipts are normally $25,000 or less to file Form 990-N also known as e-Postcards. The process is fast and easy. This is the second year of the new requirement for tax-exempt organizations whose gross annual receipts are normally $25,000 or less to file Form 990-N also known as e-Postcards. 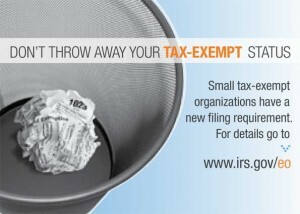 The May 15 deadline applies to all small organizations whose tax year ends on Dec. 31. Organizations whose tax year is different from the calendar year must file the e-Postcard by the 15th day of the 5th month after the close of their tax year. The e-Postcard is a simple, Internet-based form that asks a few identifying questions about the organization. The-Postcard must be filed online; there is not paper option. More information and a link to the e-Postcard can be found on IRS.gov.